20 years ago this week, The Matrix was released – a genre-defying special effects spectacle like no other. The only thing as iconic as the film’s bullet time sequences was its fantastic soundtrack, both an exploration of the burgeoning sounds of the 90s and a mirror to the movie’s politically-charged themes. So follow the white rabbit, take the red pill, and dive into the desert of the real with us as we explore three songs from the soundtrack. The scratches in the song’s breakdown come courtesy of the intro to funk band Pleasure’s “Celebrate the Good Things,” a sample that has been used in countless hip hop and breakbeat records. Rob Dougan’s trip-hop instrumental plays during the scene where Morpheus introduces Neo to the Lady in Red. The strings intro lifts from classic composer Edward Elgar’s “Enigma Variations, Op. 36,” appearing around 0:45. The final scene in The Matrix features “Wake Up” by Rage Against the Machine. The lyrics of the song touch on themes explored in the movie – free will, surveillance, and governmental tyranny. Singer Zack de la Rocha’s lyrics take aim at the FBI (particularly J. Edgar Hoover) for surveilling and murdering prominent black activists during the Civil Rights movement (“Hoover, he was a body remover,” “Several federal men pulled schemes on the dream [MLK’s dream] and put it to an end”). The refrain of the song has de la Rocha repeating “wake up,” telling listeners to come to their senses and recognize injustice – the phrase also doubles as a reference to Neo “waking up” from the Matrix. 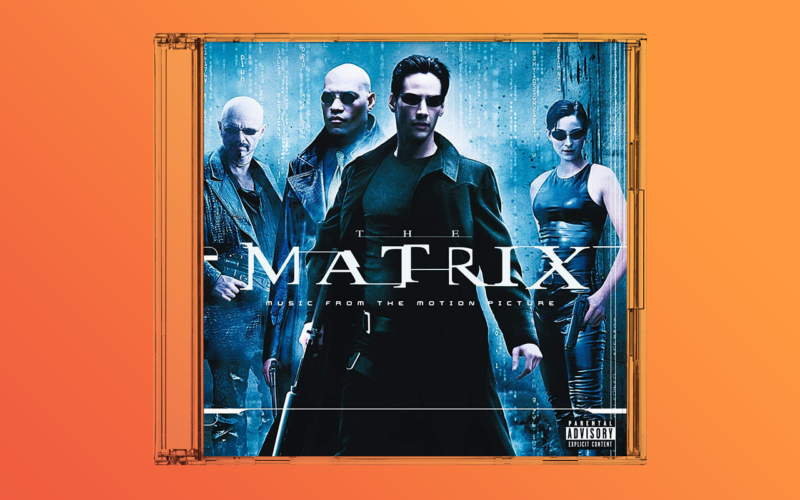 We hope you enjoyed revisiting these classic cuts from The Matrix‘s soundtrack. Stay tuned for future deep dives on classic albums, scores, soundtracks, and more.